Yesterday, I introduced you to the Zero Home: The first single-family smart home to be certified as net-zero energy-efficient in Climate Zone 5, meaning that all the energy the home consumes is produced on site via renewable resources. Today, I’ll take you on a deep dive into the systems and building practices that made this feat possible. 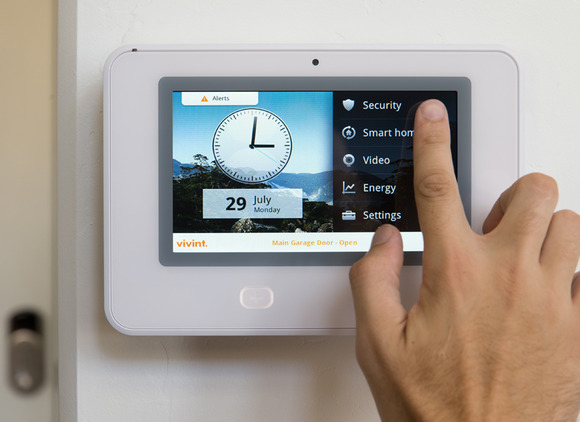 The 4300-square-foot Zero Home is the result of a partnership between Vivint (a fast-growing company best known for home-security and home-control systems) and Garbett Homes (a residential development company that builds between 400 and 600 homes per year). 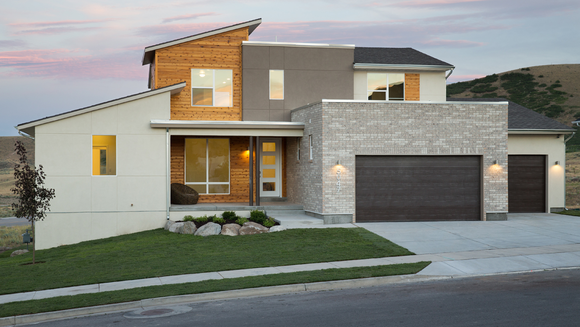 Both companies are based in Utah, and the Zero Home was built in the Salt Lake City suburb of Herriman. The Zero Home is the first residence in Climate Zone 5 to be certified for net-zero energy consumption. While giving me a tour of the Zero Home on Tuesday, Oehlerking explained that the first step to building a supremely energy-efficient home is to use unconventional framing techniques. Whereas the building code requires at least 2x4 studs for the home’s frame, Garbett used larger 2x6 lumber. This design provides more room for insulation between the exterior and interior walls. But since studs act as conduits that draw warm air into the house during the summer, and cold air into the house during the winter, Garbett engineered the house to be framed on 24-inch centers (meaning the center of each stud is 24 inches apart) instead of the more conventional 16-inch centers. Garbett Homes used 2x6 timbers to frame the Zero Home, providing more space for insulation between the interior and exterior walls. 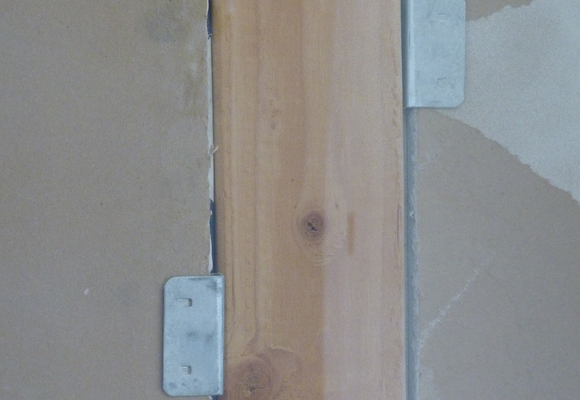 Using drywall clips allowed Garbett to use fewer studs than is typical. 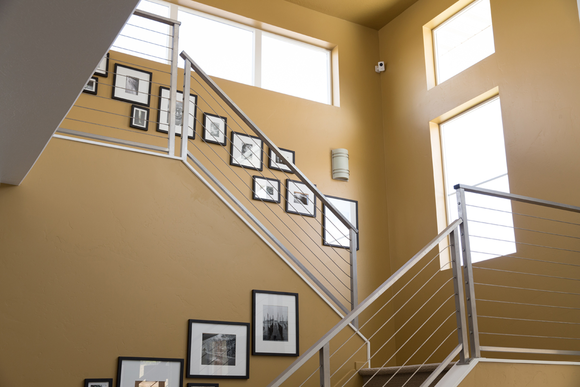 And although the typical house is framed with additional studs in its corners, Oehlerking explained that these studs don’t serve any structural purpose—they exist only to provide anchor points for the interior drywall. So to the corner studs, Garbett attaches clips that serve as backing for the drywall. Using fewer studs for the framing not only reduces the number of places where unwanted temperature transfers occur, but also reduces the cost to build the house. Once the framing was complete, the builders wrapped the exterior of the house in DuPont Tyvek—a water-resistant but breathable material—to provide a moisture/vapor barrier. That’s a typical construction practice, but Garbett further insulated the Zero Home by applying a bead of Dow EnergyComplete sealant at every point in the framing where wood touched wood, forming an air- and moisture-proof gasket. Next the crew sprayed foam insulation on the interior side of the exterior walls, and then blew in fiber insulation. Oehlerking said this technique is superior to using bats of insulation, because bats succumb to gravity over time and fall down inside the walls. The Zero Home is rendered airtight with the application of sealants anywhere air or moisture might penetrate the framing. I know that glass is a poor insulator, so I was surprised by the number of large windows in the Zero Home. I had expected the house to be relatively dark inside, but it was delightfully bright, even in the basement. Oehlerking explained that all of the windows are dual-pane, with a layer of argon gas between the layers of glass. That said, I noticed that most of the windows couldn’t open. After hearing how airtight the home was, I asked how the homeowner would get fresh air into the house. Turns out I gave Oehlerking the perfect transition to explain the Zero Home’s heating and air-conditioning system. Abundant dual-pane windows fill the Zero Home with natural light. They also reduce the need for energy-consuming artificial lighting. The Zero Home is equipped with a furnace and an air conditioner that are both 95 percent efficient. This means 95 percent of the energy the systems consume is converted into warm or cool air. Despite that very high efficiency, Oehlerking said the furnace and air conditioner will operate on standby most of the time, with each system needed for just a few days of extreme temperatures each season. The device that conditions the air the rest of the time is known as an energy recovery ventilator. 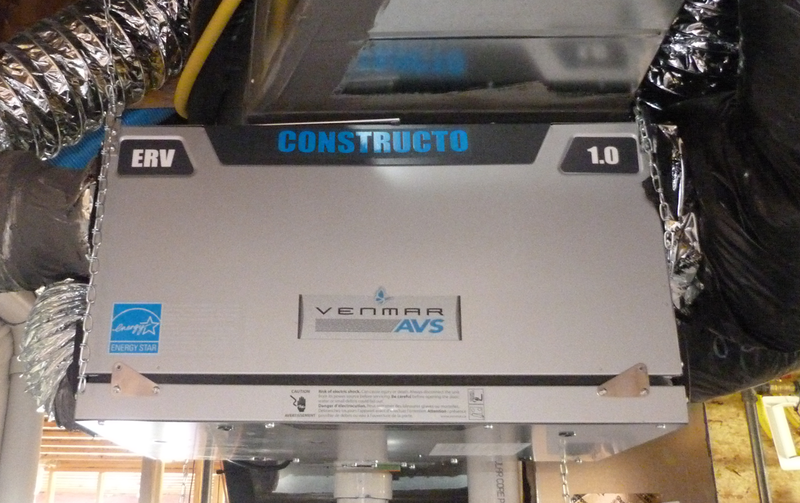 The ERV combines a heat exchanger with a ventilation system that continuously replaces the air inside the house with air from outside the house, removing the need to open windows to let in fresh air. This ERV (energy recovery ventilator) combines a heat exchanger with a ventilator to warm and cool the house while consuming very little energy. During this process, energy transfers from the outgoing air to the incoming air, cooling it in the summer (when the air inside the home is cooler than the air outside) and warming it during the winter (when the interior air is warmer than the air outside). HEPA filters continuously scrub the air to remove pollen and other airborne contaminants. “The air inside the Zero Home is as clean as it would be in a hospital operating room,” Oehlerking boasted. 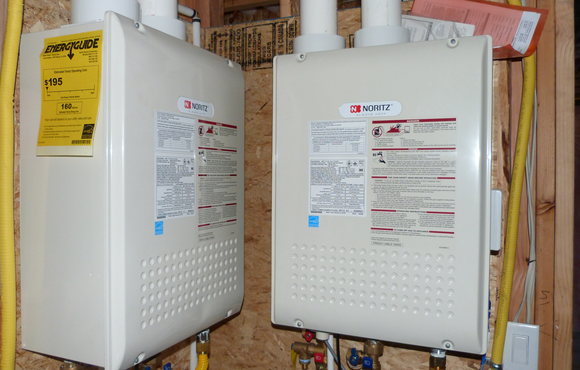 Conventional water heaters are one of biggest energy wasters in the typical home. They keep 40 to 50 gallons of water piping hot 24/7, even though you might need hot water only in the mornings and evenings to bathe and to wash the dishes. 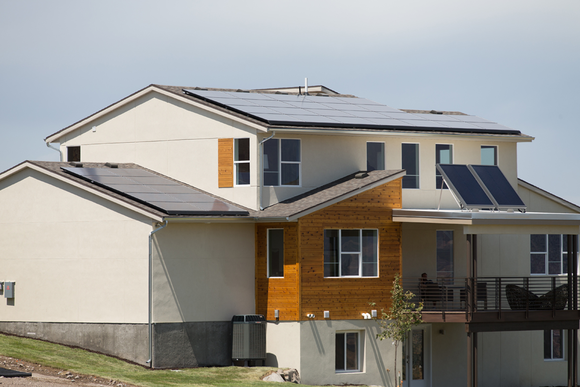 The Zero Home uses the sun’s energy to heat 40 gallons of water to 86 degrees by circulating it through a pair of solar panels mounted to the home’s roof. Water continuously circulates through the two smaller solar panels above the deck, heating it to 86 degrees. When you want hot water to take a shower or to wash your clothes or dishes, this prewarmed water is pumped from a 40-gallon tank into tankless water heaters, which use natural gas to boost the water to 104 degrees as it passes through on its way to the spigot. So the on-demand water heater consumes energy only when it’s actively heating the water you need. Tankless water heaters provide hot water on demand, which is much more efficient than keeping a tank of water hot 24/7.